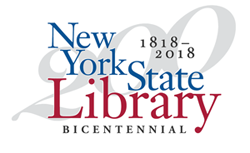 April 21, 2018 marks the bicentennial of the New York State Library: it was on that day in April 1818 that Governor DeWitt Clinton signed into law a bill to establish a library at the seat of government in Albany. The New York State Library was the third state library in the country, following Pennsylvania and Ohio. 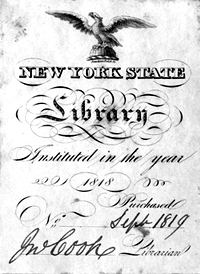 At the time of Governor Clinton's election in 1817, there were only 27 libraries for public use in New York State, and New York City libraries collectively housed a mere 12,000 volumes. However, there were several events that gave rise to the idea of state libraries. At the national level, the Library of Congress had been established in 1800, and Congress began sending copies of all its laws, journals and documents to each state in 1813. At the state level, document exchanges also began to take place, encouraged by an 1811 resolution of the Massachusetts Legislature that urged their Secretary of State to establish an annual exchange of statues with other states. As these government documents accumulated in the capitol building, it would have made sense to create a separate library to collect, organize and provide access to them. On another level, though, Cecil R. Roseberry, in his 1970 History of the New York State Library, cites the ends of the French Revolution, the Napoleonic Wars, and the War of 1812 as a breeding ground for the embrace of intellectual thought, and Americans embraced progress, notably through the introduction of steamboats, railroads, and ambitious physical infrastructure projects like the Erie Canal. The venture to establish a State Library was a natural step toward a similar intellectual infrastructure, not only for the branches of State Government, but also for the education of its citizens. DeWitt Clinton, an adept politician and an ardent supporter of the construction of the Erie Canal, was also considered one of the most erudite of New York's governors. One of Clinton's most valued possessions was his personal library, accumulated over many years, which was described by a contemporary, David Hosak, as a "large and well-selected library of scarce and valuable works." It is hardly surprising, then, that Clinton saw the value of creating a State Library and worked to make it happen within his first year in office. John Cook served as the first State Librarian, from 1818 until his death in 1823. Cook was an English expatriate who ran a joint reading room and mineral water business at 353 North Market Street, to which the Albany Argus gave specific directions in 1823: "3 doors north of Rockwell's Mansion House, and opposite the Post Office," which places Cook's reading room near the present-day intersection of Broadway and State Street. The State Library, initially occupying a single room on the second floor of the first State Capitol, opened its doors upon the arrival of the 1819 Legislature with 669 volumes and nine maps. Initial expenditures included $2,617.20 for books and $206.06 for bookcases. 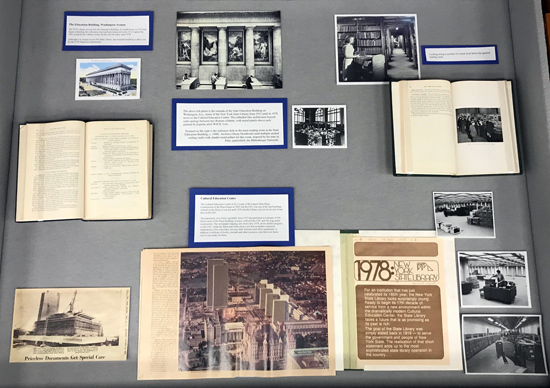 Though it was in the State Capitol building and served the State's government, less than half of the State Library's initial collection contained volumes dedicated to law; the Library also purchased books of classic literature, history, travel and biography. The original catalog listed works by Chaucer, Aristotle, Benjamin Franklin, Samuel Johnson, Alexander Hamilton, Adam Smith, and Cadwallader Colden. The State Library also held many statutes and documents of the federal government and other states and became an official repository for federal documents in 1858. Melvil Dewey became the tenth State Librarian in 1888, leaving his previous post at the library school at Columbia University. Dewey was an eccentric figure passionate about simplification: he changed his name from Melville to Melvil to eliminate redundancy, and for a time, attempted to spell his last name "Dui" for the same reason. The State Library established specialized libraries in medicine, education and legislative reference in 1891. The New York State Library for the Blind was established in 1896, marking the origin of today's New York State Talking Book and Braille Library. The 1890 census had indicated that approximately 5,000 residents of New York were blind, and the 1896 Board of Regents resolved to establish a library division from which any blind reader in the state could borrow materials. Dewey transferred the library school he had begun at Columbia University to Albany, renaming it the New York State Library School. Traveling libraries, which Dewey dubbed "peripatetic libraries," were established in 1892, after the State Legislature authorized the State Library to lend a library-board-chosen selection of 1,000 books, arranged between ten miniature libraries and dispatched around New York State. Though traveling libraries had existed in library cars on the Boston & Albany Railroad for the benefit of isolated employees, the State Library's traveling libraries were the first project of their kind to be run by a state agency in service of the entire state. Dewey's traveling libraries pioneered what would become known as Library Extension and, later, the Division of Library Development. The State Library's role in education and state-wide access to library materials expanded. The State Library is considered the cradle of the New York Library Association (NYLA). 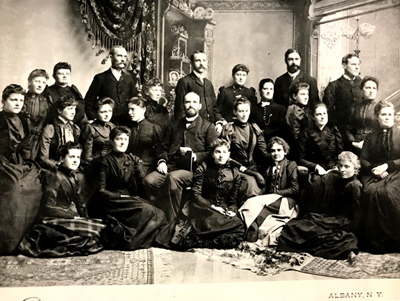 In the summer of 1890, 43 individuals interested in promoting the usefulness of libraries throughout New York State met at the State Library, and the meeting resulted in the formation of NYLA. The State Library became part of the State Education Department in 1904. 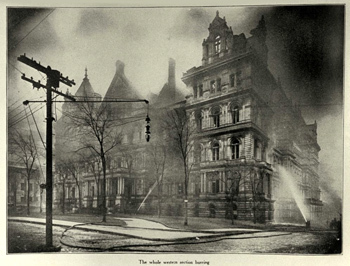 A fire in the State's Capitol building in the early morning of March 29, 1911 destroyed almost the entire New York State Library collection. The State Education Building had been under construction, and the Education Department had been only months away from moving out of the Capitol building. The fire was tragic: Samuel J. Abbott, an elderly Civil War veteran and night watchman of the building, died in the fire, and most of the Library's near-century's worth of valuable collections was gone. Although the traveling libraries that Melvil Dewey established a few years earlier inadvertently saved some 45,000 items from destruction, the collection loss was nonetheless staggering: 450,000 books and 270,000 irreplaceable manuscripts were destroyed in the fire. most of the Library's collection of Washington's personal possessions. In 1962, Governor Rockefeller presented Horner with a silver medal from the Civil War Centennial Commission for his actions. The State Library, under the guidance of State Librarian James Ingersoll Wyer, Jr., and with a substantial budget granted by the State Legislature and generous donations from around the world, notably the British government and the British Museum, began to rebuild its collections. The Library reopened in 1913, in the new State Education Building. The Education Building was the State Library's fourth location: it had moved to a building near the first Capitol building in 1855, necessitated by the expanding collection, to a stand-alone building on State Street, and then to the new State Capitol building in 1883. Wyer’s vision incorporated what he termed the "New York idea" of a State Library: one that served libraries large and small, in universities and rural schools, and that would be known for its robust central reference repository as well as vast lending infrastructure. 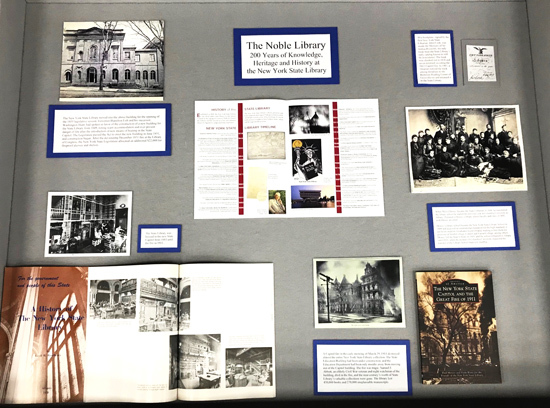 Another of 30-year State Librarian Wyer's contributions was the creation, in 1913, of an interlibrary loan program with military training camp libraries. This marked the first time a library was inventoried for war-time efforts, and the model was replicated nationwide, serving countless soldiers in military camps and hospitals during World War I. Wyer was appointed chairman of the American Library Association committee on camp libraries. During Charles Gosnell's tenure as State Librarian (1945-1962), the State Library launched the New York State Freedom Train, a three-car train that toured the state from 1949 into 1950 and displayed treasured items from the State Library’s collection—including the significant Lincoln and Washington manuscripts, as well as papers related to the rise of feminism and New York’s abolition of slavery. The train stopped in 159 communities and was visited by 976,716 individuals. 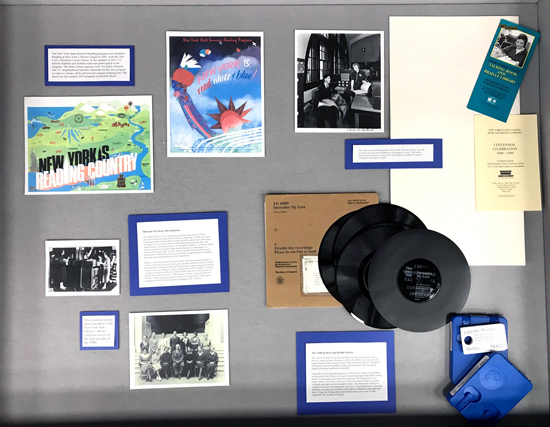 There was a lot of change occurring in the country in the 1970s, and it was no different for the State Library during this era. 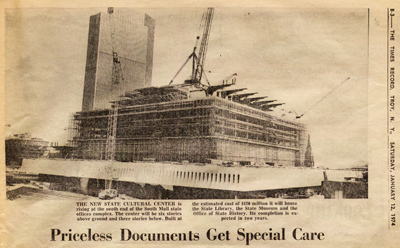 Perhaps most notably, New York was constructing the Empire State Plaza to house many of its government offices, and the Library, having once again outgrown its existing space, was planning its move into several floors of the Cultural Education Center (CEC), which would anchor the Plaza on the Madison Avenue side and house, in addition to the Library, the New York State Museum and the newly created New York State Archives. The Library completed the move to the CEC in 1978. While the Education Building had been designed with many classical elements, including the front colonnade of 36 Corinthian columns, the Library's new home would be in a starkly geometrical and modern complex designed in the Brutalist style. It was also during the 1970s, specifically in 1974, that the New Netherland Project was begun to transcribe and translate documents from New York's Dutch colonial period. Today, the New Netherland Research Center in the New York State Research Library offers researchers, students, educators, and the public an opportunity to access early Dutch documents — primary sources and translations — that trace the Dutch presence in the American colonial period and the trajectory of its lasting impact.